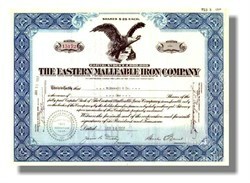 Beautifully engraved Certificate from the Eastern Malleable Iron Company issued in the 1950's. This historic document has an ornate border around it with a vignette of eagle. This item has the printed signatures of the company's president and treasurer and is over 44 years old. The Company was incorporated in Connecticut in 1912. 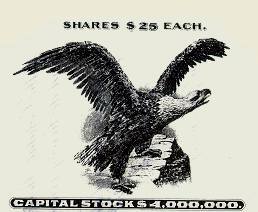 It was a result of the consolidation of the Bridgeport Malleable Iron Company, Vulcan Iron Works, Naugatuck Malleable Iron Company, Troy Malleable Iron Company, and Wilmington Malleable Iron Company. The company was engaged in the manufacture of of certified malleable iron, gray iron, and semi-steel castings: also wagon wheel bands, electrical brackets and tank lungs. In 1924 they produced over 75,000 tons per year.